The second Canadian team in the BTLNHL countdown is the Winnipeg Jets, coming in smack-dab in the middle, at #15. It’s also the last team in the Southeast Division to be included, giving the division the honour of being the weakest division in the league in terms of logo design. Winnipeg, the most hockey-est of those markets, takes the division title. But, it’s fitting that the Jets come in at #15 because it’s pretty middle-of-the-road logo. There’s some good things happening with the logo, but it’s, well, a bit bland. This would be an exquisite logo for the Winnipeg Jets if the Jets were a curling team, as the logo portrays as much excitement as a curling match. This is nothing against curling, which can be enjoyable to watch (or comical, if you’re watching the Norwegian men’s team), and it’s even better to play while intoxicated. 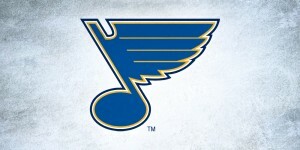 But this logo should be built for hockey. A bit of context: The logo was inspired by the Royal Canadian Air Force logo (no kidding, you think?) which has extensive historical and physical ties to the city of Winnipeg. This connection was emphasized when the jersey unveiling occurred right on the Air Force base. So, a fighter jet mixed with the RCAF logo makes sense conceptually. 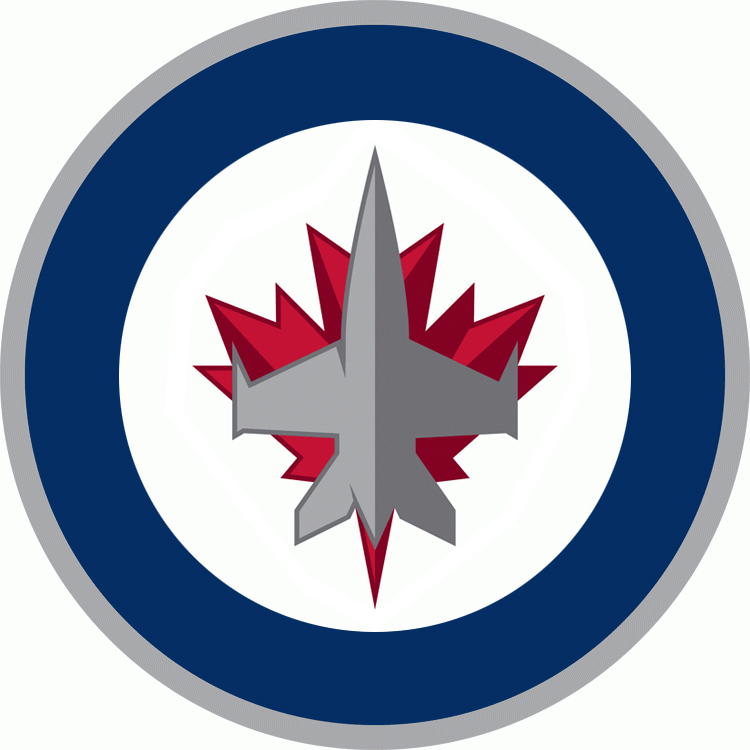 A bit of context based on my own suspicions: True North, who owns the Jets, wanted to name the Jets something else so as to create a brand new identity for the team, not based on anything from their former incarnation from 1972-1996. Names like the Falcons (another salute to the past), Polar Bears, Moose and Whiteout were rumoured to be in the running. But, the people of Winnipeg, ecstatic that the NHL was coming back to the city, held mass celebrations after the formal announcement of the NHL’s return, and they basically demanded that they bring back the Jets, not only in spirit but in name as well. My guess is True North already had plans and designs for a completely different direction (my gut says the Falcons) but after having amassed so much good will for bringing back the NHL to Winnipeg decided not to mess with it. A new logo and uniform was quickly needed (which would explain why they didn’t have anything ready until well into the summer, and after the draft) and kind of slapped together in haste. Of course, this is all my guesswork, but it seems to make sense. Note: I found this article of a short interview with the lead designer that basically confirms how rushed a process the whole thing was. At one point he says they didn’t really have any other working concepts for the jersey, which to me, seems completely nuts for a project of this size and stature. For a rush job, it’s not a bad job. But, there’s still hints that this was a rush job. The layering of the fighter jet over the maple leaf seems lazy, and actually can be misconstrued as something else. The inclusion of the maple leaf at all is also curious. I can understand it when included on a Canadian team logo that’s predominantly an American sport, like baseball or basketball. But a sport like hockey, which is second only to poutine in a Canadian’s heart, it’s becomes something else. 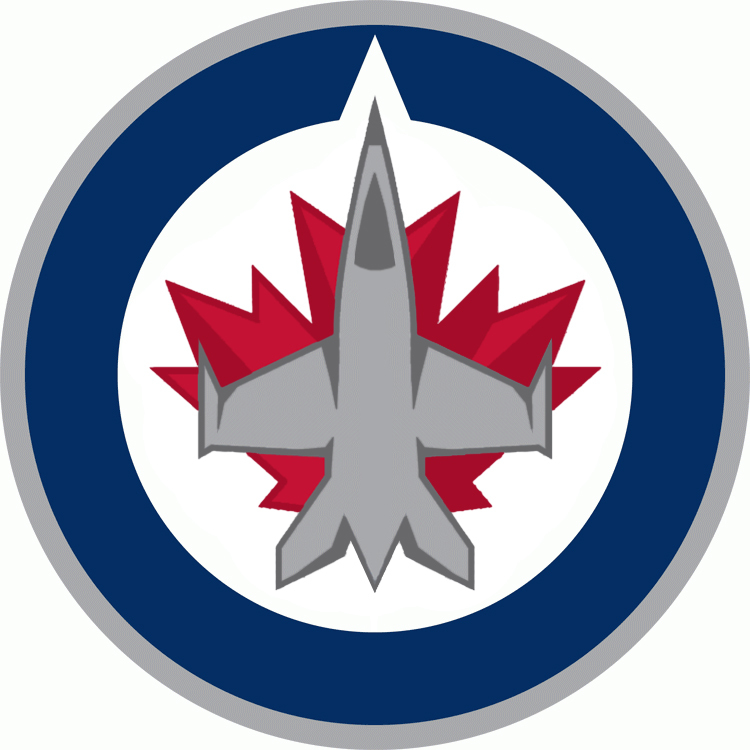 The Jets are not “Canada’s team”, like the Blue Jays or Raptors, and the use of the maple leaf seems either a lazy inclusion (“Hi there, we’re from Canada!”) or too heavy-handed (“Hi there, you’re Canadian? Not cheering for us is like spitting in the Queen’s face you scumbag!”). The jet itself is a bit bland as well, not really instilling an idea of speed, velocity or strength. Rather, it’s more of an icon that’s placed there because it was convenient and necessary. Perhaps using the two tones of grey to show off some of the contours of the jet would give it a little more personality and positive qualities. It seems the time they spent creating shadows and contours on the maple leaf should have been spent on the jet. Here’s a very quick, rough version of a revised logo with the jet changed (without actually researching the contours of the plane being shown, so be gentle on me), the pointy tail of the leaf taken out (I’ve never seen a maple leaf with a tail like that myself) which allows the jet to get a little bit bigger, and the shadows on the leaf decreased a bit to let the jet take centre stage. I’m not even sure I like it that much, but like Tiger Woods, I’m just messing around. But it gives the jet a little more personality. Okay, I’m starting to talk myself out of ranking the logo this high, but sometimes that whole is greater than its parts. Like I said earlier, although it’s a rushed job and some of the details need to be worked out, the concept is there. It also gains points for trying to connect itself very closely to the community and the identity of Winnipeg. If you look at other relocated sports teams, the teams don’t make any effort whatsoever to identify itself with its new locale. Have you ever seen a grizzly bear in Memphis (originally from Vancouver)? Or, when did you last visit that jazz hotspot,Utah (originally from New Orleans)? Of course, Winnipeg’s hand was forced a bit with the Jets’ legacy – a “Winnipeg Thrashers” announcement would have created mass hysteria and riots in the city – but it still deserves commendation. And it’s a refined and minimal logo that’s trying damn hard to be iconic before its time, which earns respect. And the colours palette works well. Two tones of blue (on the jersey), mixed with grey and a splash of red looks pretty slick. It feels like a more refined and contemporary version of the old Jet’scolour scheme. There’s one part of the logo that I love, love, love. The little wedge removed from the top of the blue circle to make room for the nose of the jet is actually a small piece of design genius. 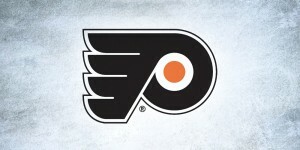 It does two things: (1) it allows the jet to have more presence within the logo than it otherwise would have, and (2) it creates a recognizable design element that is unique to the rest of the league and instantly connects any other design with this element directly to the Jets. It’s something all brands die for, and it is easily my most favourite part of the logo. Note: The wonderful Melissa Martin opened my eyes with the now-obvious information that the removed wedge also represents a compass, and of course, it’s pointing True North. Much thanks to her and a facepalm for me. Ladies and gentlemen, the newest team in the NHL, the Winnipeg Jets, comes in at #15. I do agree with most of your points. 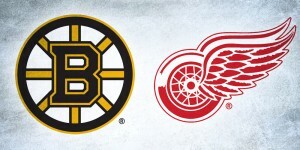 This is another logo that smacks of a “generic” EA NHL game logo. In saying that, though, I think it works. Other than using one of the teams past logo’s, there’s not much else they really could have done with what they had to work with. I really like the ties to the military, and I love the colour scheme (which my St. John’s IceCaps, farm team of the Jets, also share). 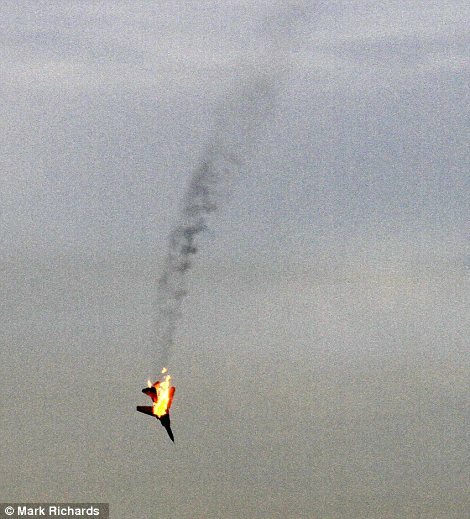 I believe the “pointy tail” of the maple leaf you mention, may actually be fire coming out of the rear of the jet. If that is the case, then I am much happier with it, and how it almost doubles as part of the maple leaf and part of the jet at the same time. It may be the intent to make the stem/afterburner be the same thing, but I don’t see it, mostly because the red is wider than the grey. Could be that this particular aircraft has a wide afterburner, I don’t know, but it doesn’t quite look right on the logo, in my opinion. Hopefully in a few years we won’t see “an overhauled alternate jersey with a totally redesigned logo that will phase this one out.” Teams, companies and organizations with substance and class don’t redesign their logos – they pick something good and stick with it. In this league, 15th is nothing to be ashamed of. There’s some really beautiful logos remaining and the Jets have a great one too. It’s just that the others are just a bit better. Will I am disappointed that we weren’t higher you made some fair points. When I first saw the logo I immediately thought of the military and thought it seemed a bit generic. But it has grown on me over time, but I can’t figure out whether I actually like the logo or because I have convinced myself to like the logo because the Jets are my team. You mentioned it seemed rushed and here I think people need to understand. When the logo was unveiled True North talked about how when teams come up new logos and uniforms it usually takes 18 months. TN came up with this logo and uniform set in 6 weeks, so for a super rushed job I think they did really well. Totally understand that it can be hard to separate your team from completely subjective thoughts, and I’m thinking I might be called out on that later in the BTLNHL list! But, I’m trying my best! And yes, for an incredibly rushed job, they did pretty well. Better than half the teams in the league I think. Nothing to be ashamed of for sure. Any comment on where the old jets logo stands? That is something I hope to start soon, a look at logos/uniforms from previous teams. And I’m a huge fan of the Whalers logo as well. One of the best! Yeeeah, the Blue Jays and Raptors aren’t either. To wit, Seattle teams are a hop, skip and jump away from Vancouver. Toronto teams aren’t. Fair enough, but the Raptors and Jays are the only Canadian teams in their respective leagues, so it gives them a little leeway in terms of having a maple leaf on their logo. I really like the Jets’ logo and thought they would rank higher. However, you and the Jet’s new owners fall short on the aircraft choice. You’ll notice that the silhouette looks very much like the outline of an F-16 Fighting Falcon http://en.wikipedia.org/wiki/F-16 whose origin was from the United States. If you do a little research you’ll find that Avro of Canada built two jet fighters designed and built exclusively in Canada. One was the CF-100 and the other was the Avro Arrow. I would think either of these would be more appropriate for the Winnipeg Jets. OK, there are a few problems to get over. First, the CF-100 http://en.wikipedia.org/wiki/Avro_Canada_CF-100_Canuck was called the ‘Canuck’ so that could be an issue for history buffs. So that leaves the Arrow which has a very cool looking outline http://en.wikipedia.org/wiki/Avro_Arrow. It never made production due to defense(ce) cutbacks but it did fly operational tests and was one of the fastest jet designs for its day. Bottom line; either would be more appropriate than a design based on the American F-16. And just for the record, I’ve been in the American military for over 20 years. A very good point that I hadn’t thought of. My guess is they wanted something that was contemporary and modern, rather than the Canuck (30 yrs old) and the Arrow (cancelled in the 50s). Their old logo had something very generic (or at least that’s the way it looks to me, but you would undoubtedly know better), so I’m thinking they wanted something more fearsome and something that reflects Canada’s current air fleet. Just a guess though.